1)In 1984, India won the inaugural edition based on points. No final was played. 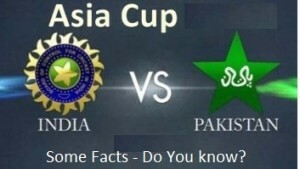 3)Both arch rivals never played final in Asia Cup. 5)Pakistan played 4 times in Final. In the year 2000 and 2012, they beat Sri Lanka and Bangladesh, respectively. 6)Pakistan was scheduled to host 1993 edition which was cancelled due to some reason. 7)In the 1991 edition Pakistan refused to participate the event hosted by India.